Pro-Russian gangs keep violating the de-escalation of the conflict in the Donbas, according to the ATO Headquarters. During the last day, January 31, militaries opened fire against the ATO positions 53 times. They also employed the weapons prohibited by the Minsk Agreements. During the day, no Ukrainian militaries perished or being wounded. There are 1,021,490 IDPs from the temporary occupied territories and the Anti-Terrorist Operation zone, according to the information of the State Emergency Service of Ukraine, 999,420 IDPs from the Donetsk and Luhansk regions and 21,770 IDPs from the annexed Crimea. Zaytsevo entrance-exit checkpoint will stop working from February 3, as it was informed by Pavlo Zhebrivsky, Chairperson of Donetsk regional military and civil administration. The decision was made at the meeting of Zhebrivsky and the Chief of the ATO Headquarters on Monday 1. The checkpoint closure is caused by numerous shellings on the part of the illegal armed groupings. There was an «anti-fascist rally» in occupied Luhanst on January 30. 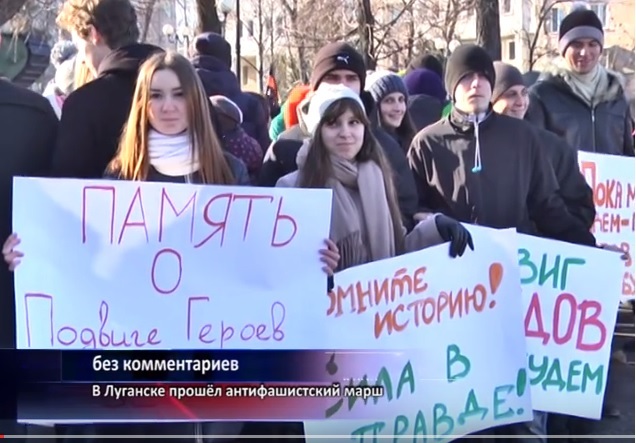 The participants said that the rally was devoted to the 73d anniversary of the beginning of the Luhansk region liberation from German-fascist invaders. At the same time, the participants claimed in front of separatists' MM cameras that the were protesting against «neo-fascist invaders». The participants marched along the city streets from the eternal flame at the memorial to fighters for the October Revolution to the monument to the victims of the Organization of Ukrainian Nationalists and the Ukrainian Rebel Army. Pro-Russian militaries placed video chronicle on Youtube hosting. 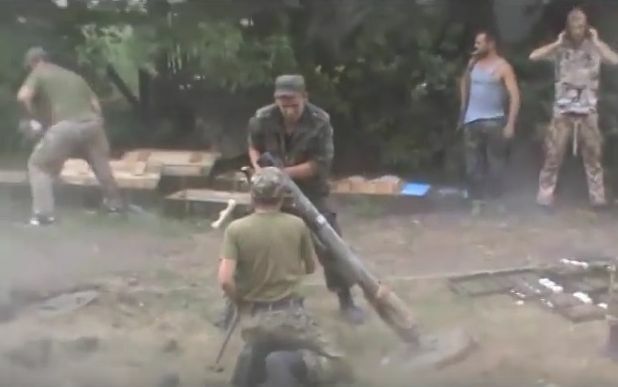 The video showed how they were destroying Ukrainian village Kozhevnya in the Donbas in summer 2014. The “DPR” militants started their assault on the village, located on the border with Russia, on July 22, 2014. They did not conceal their aim which was to grab a piece of the border to make it easier to get ammunition and military equipment from Russia. The assault was preceded by a powerful shelling from tanks. They do not even conceal the fact that the major part of the militants participating in the assault were from Russia. As a result, the village with civilians was almost completely destroyed. The information was confirmed by illegal “DPR” grouping leader Aleksandr Zakharchenko. «The village was completely destroyed by us», he confessed. Russian leadership has cut funding for the illegal «DPR» organiztion. As it is informed by Aleksiy Matsuka on Facebook, financing the occupied territory of the Donetsk region reduced by 30% compared to 2014. According to the journalist, it is connected with the fact that the occupational administration earned only 50% of the income planned for January. Earlier Donbas Public TV informed that the «DPR» grouping adopted the budget only for the first quarter of 2016.